Join Vision Zero Chicago on November 19 at 11:30 a.m. in Federal Plaza (50 W Adams St) in commemoration of World Day of Remembrance for Road Traffic Victims (WDR). The event will feature a display dedicated to the memories of the victims of traffic crashes over the past year in Chicago and a press event with agency officials and partners speaking to remember these individuals. RSVP here. 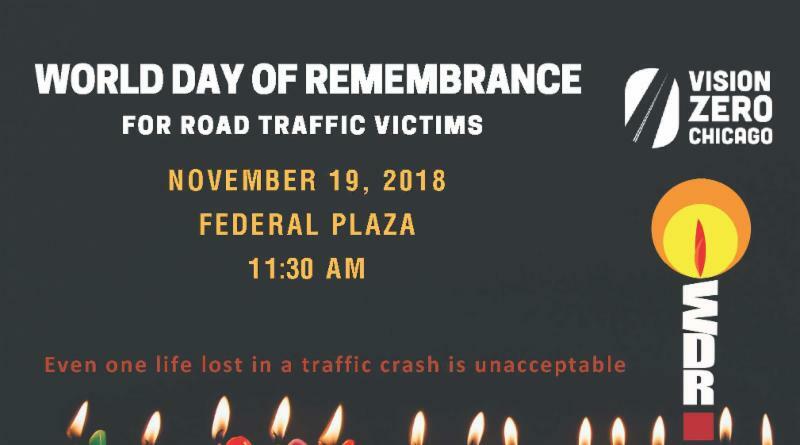 ● November 19 at 11:30a: A press event will be held in Federal Plaza in commemoration of World Day of Remembrance and in support of action to prevent traffic crashes. Please join us to add to the memorial at this time and attend the event. *Guidelines for Memorial Mementos – Permitted: Flowers, photos, battery powered candles. NOT Permitted: Items that must be returned, flames/candles, items larger than 2 square feet.